Keeping the whole place warm would be an exercise in futility... and a massive gas or electric bill! Unfortunately, the roof (what's left of it) is thin steel, so the heat goes through it like it wasn't there. 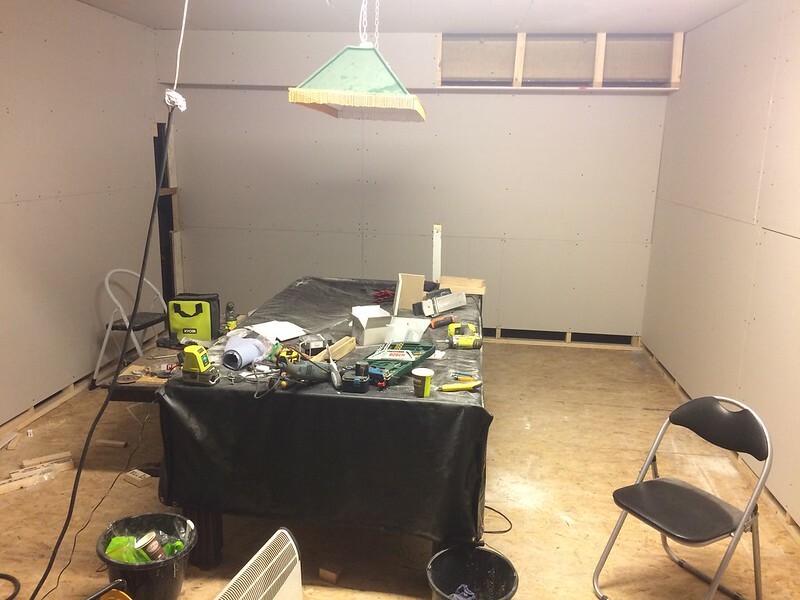 Hence, the office... even without insulation it'd be possible to keep it somewhat warm, I'm hoping to be able to put something up (waiting for word on a bunch of reject Kingspan which would do me nicely) which will keep it warm in winter & cool in summer; but we shall see. 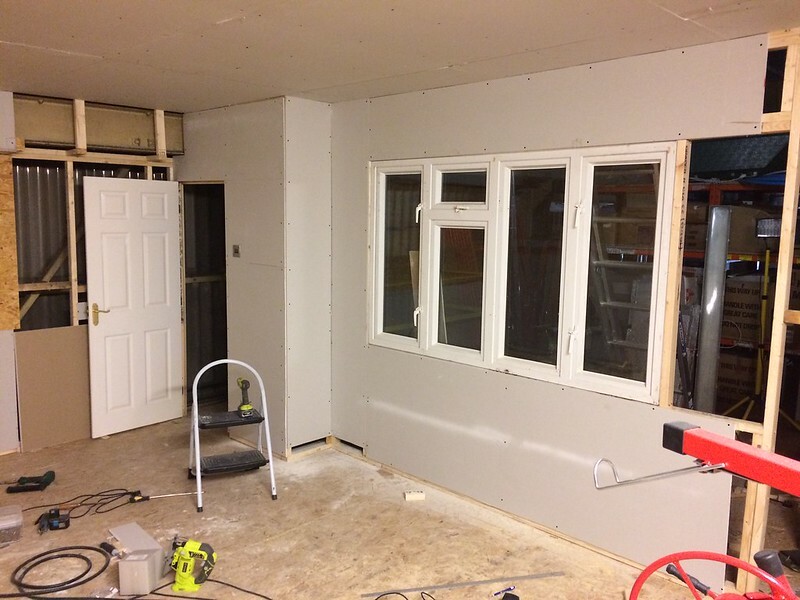 I insulated the outer walls of my workshop with panel from accident damaged fridge trucks! A friend of mine works for a fridge truck builder, when a driver tries to get under a bridge that's too low the resulting damage even if it's only in the front means replacing the a of the insulated body (apart from the floor!) as the panels can't be replaced! -18 degree trucks have continuous sides and roof panels, both sides polyester with 50mm of high insulation foam between. The roof sections are 80mm. an aditional bonus, on the inside there 1mm stainless cladding about 1.5meters high! My mate is always pleased to get this stuff "recycled", they have to pay to get it recycled! I would be very keen to know if your friend would be willing to part with some of this stuff? Could I possibly ask you to contact him & find out if he'd be happy to hear from me? I could take loads of stuff off him.... got a few ideas which need some stainless steel sheet too! Depending on where he is, I could show up with a large van to be filled... and it'd all be going to a good home! Well, that would be difficult as he's south west of Paris and on to of that, they don't have them all the time. You also have to cut the panels up yourself. I was thinking more like you could ring round your local fridge truck builders and see what they say! Doh! I was hoping this was a friend from before you scarpered off to France! Good intel though, I'll do the yellow-pages dance & see what I can find. I don't have many friends from when I left, it was thirty seven years age! Anyway... 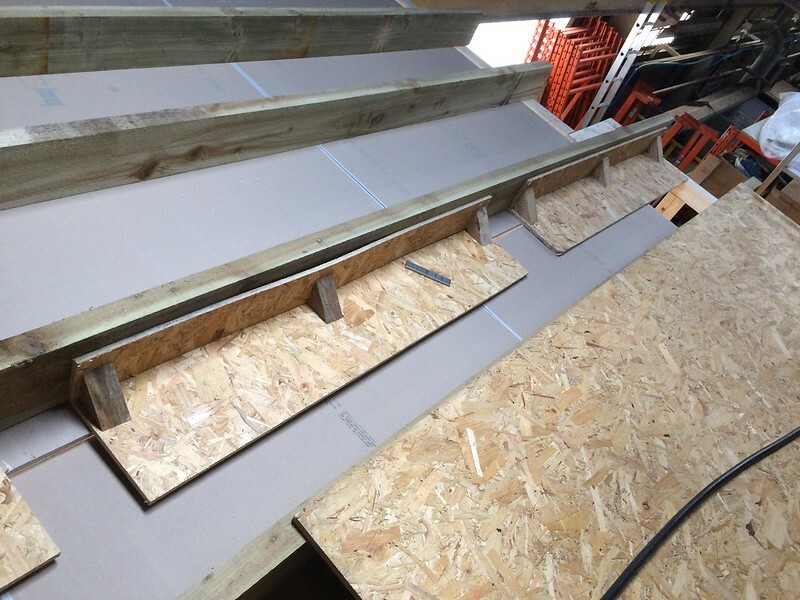 I spent most of the day (when I should have been working on the day job) slaving over a hot* calculator, and I figure I can insulate the whole office, sides & roof, with 50mm rockwool (100mm on the roof) for about £250 quid, minus the VAT which I can reclaim. So TBH I'll probably go down that route, it's not too bad an expense, and the company will deliver it all to site which saves any faffing about. And most of the rockwool will simply squeeze between the studs, there should only be a little bit of cutting involved, e.g. around the window, and where the stud spacing has been "tweaked" for various reasons. 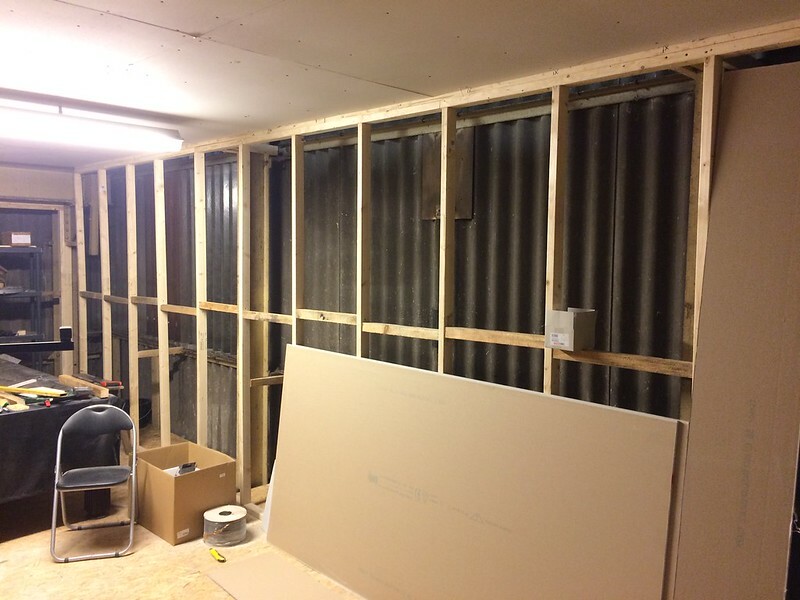 50cm is what's used on internal walls for sound proofing! Did you work out what expanded polyurethane foam would have cost? Eight centimetres on my roof is supposed to be the equivalent of twenty centimetres of fibreglass wool! I also recommend buying some hydrocortisone 1% cream ready for afterwards. Tell em it's for a rash ( it will be). Have fun in USA before they wall up. 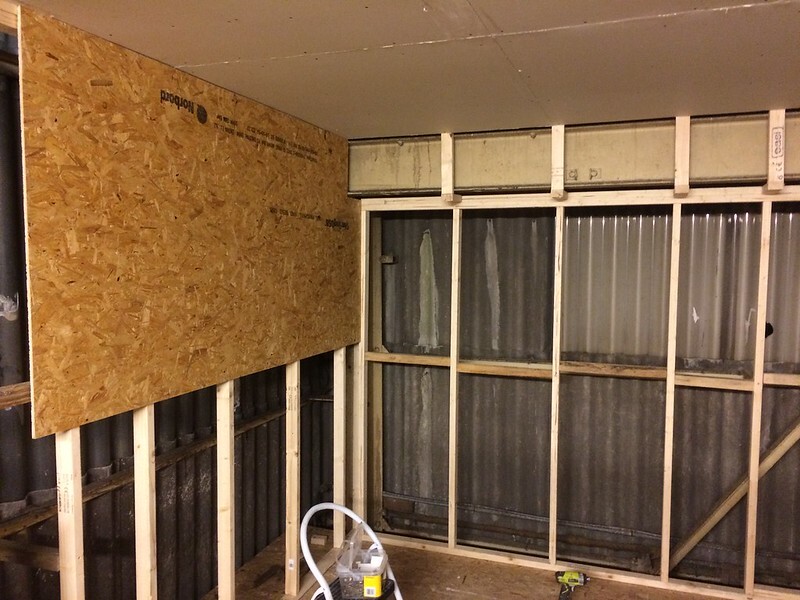 Some of the plasterboard was sagging a bit where the joints didn't meet the joists... 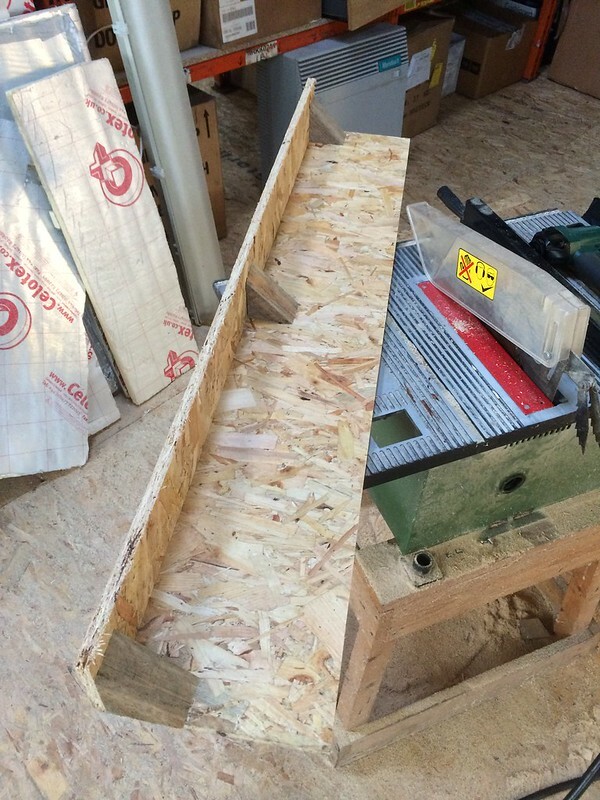 So, I threw together a couple of right-angled bits of OSB (handy things, mitre saws...). then clambered up onto the roof & nailed it into place (air-powered staple gun, yeaah). That done, I could return to ground level & screw the plasterboard up to the new wooden support. Which has nicely cured the bowing. And then the plasterboard below is screwed up into the flat bit, which brings the ceiling nice and level (ish) ready for a skim. The air-powered staple/nail gun is one of the most useful woodworking tools I've got... it's handy for sticking carpet tiles down to a wooden floor as well If I recall correctly, a snip at £20 or £30 from Aldi. Or Lidl. One of them. Last job of the day was to get the first corner wall up. 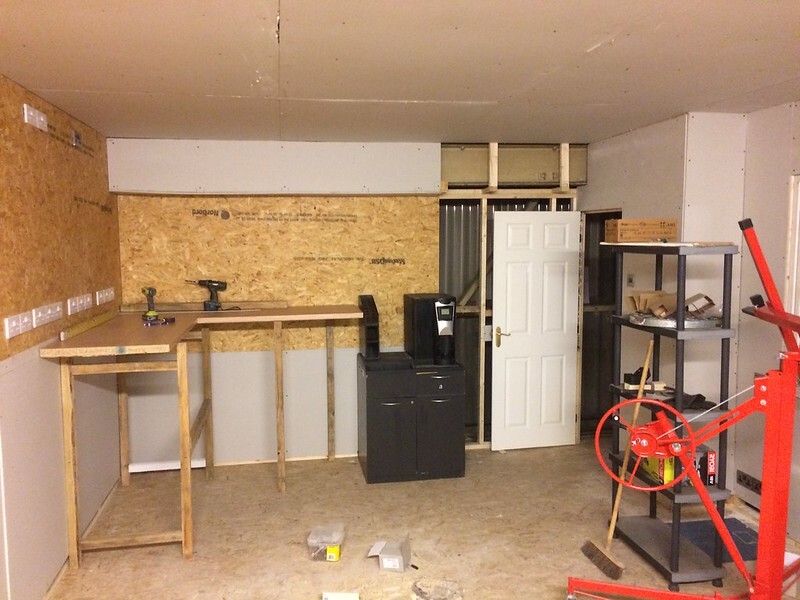 I'm using OSB here, because I will be screwing lots of those little storage draw cabinet things, all full of electronic components, to the wall in this corner; this being where the electronics work will take place. Once again, the nailgun came into its own here, and the plasterboard lift usefully held it in position while the first few nails were shot in. The plasterboard will have to be screwed to the wood, the nailgun is far too vigorous for such a feeble material. 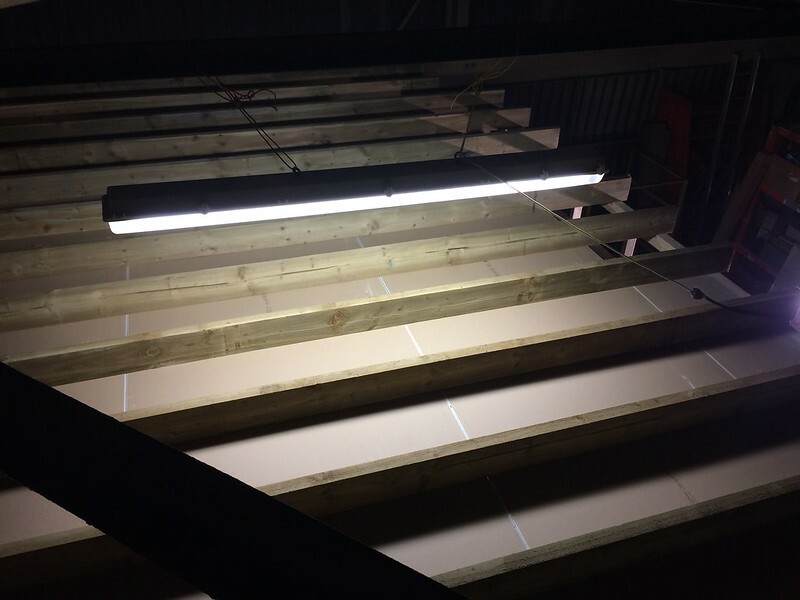 How to get rockwool insulation behind an 8ft board, without falling down a 10 foot sheer drop! The best way to extricate oneself from a 10 foot sheer drop onto sharp and jaggy things without severing an artery! PS: No spirit levels were harmed, or even consulted, during this construction project! I bought a Ryobi Multi-tool a couple of weeks back, that chops through plasterboard PDQ. Unfortunately, it's hopeless at going through OSB... fortunately I have jigsaws and drills for that. 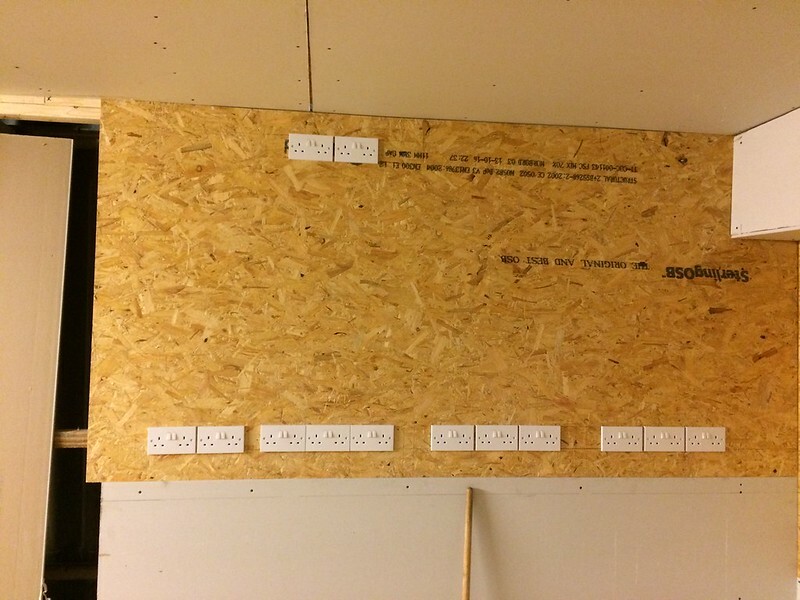 I do plan to have many sockets on the electronics wall, I have a row of 10 (or maybe 12, I forget now) in my existing office, and even that isn't enough! 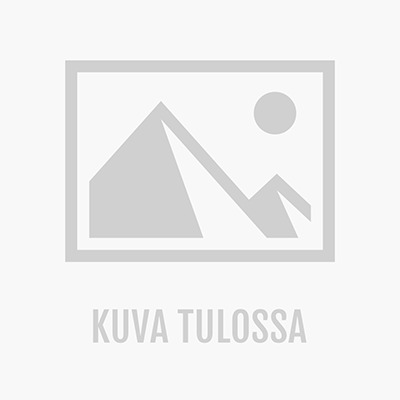 Are your junction boxes square like in USA or round like some parts in europe? Wiring is pretty nice when prior sheeting, best to plan ahead. After wall plates are done.....it is a pain. Ade, for lots of sockets in a small space I use the distribution strips used in server cabinets. (Not to be confused with the 4 way rubber domestic ones). Plastic 3 compartment trunking isn't cheap, but does make the wiring of sockets (and subsequent alterations) very simple. You can also run phone and Ethernet cables inside. just a thought. I have a padsaw, and the multi-tool, and the air-powered reciprocating saw (like a jigsaw really, only shorter) for the plasterboard. So that won't be a problem. Andrew- i already have a few strips like that, a couple of 12-ways and at least one 10-way... but they're ugly and stick 2" out from the wall (before plugs). I'd like this place to look a bit classy at least, so I'll be going with flat double-gang sockets & lots of them. Possibly in black Nickel finish I don't mind spending some extra time cutting holes, and I think the end result will be worth the hassle. merry Christmas and a Relaxed New Year ! For rockwool- tie the damn stuff there with bailer band (polypropylene string very strong and available in vast lengths cheaply via your local farmers supplier. ) 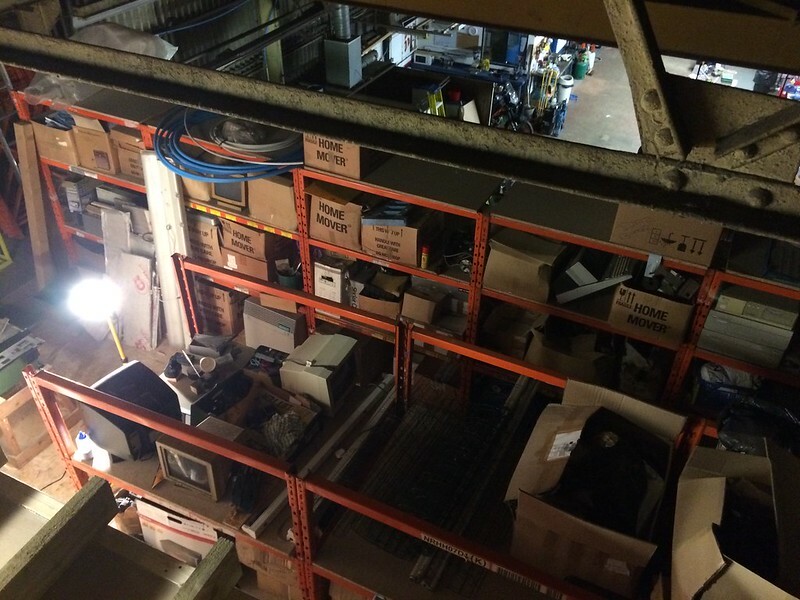 Drop it from the top of the office into the cavity and tie to the uprights with bailer band. Don't forget the Tyvak undergarments mind you or the itch will surely get you. Oh and wash your hands before dashing outside for a leak . Ps whilst up there might be an idea to lay and staple some thick polythene sheeting over all that OSB and joists just in case of water leaks ? I'll replace one of those double sockets with network points... but that'll still leave 24 power outlets, should be enough to cope with my electronics bench. There's a few more to go on the other wall too... Went with white ones because they were literally 1/4 the price of the fancy ones; but I've got some chrome ones as well, they'll be hooked up to an uninterruptable power supply, so the computers (and whatever's plugged into them) will stay running even if there's a power cut. 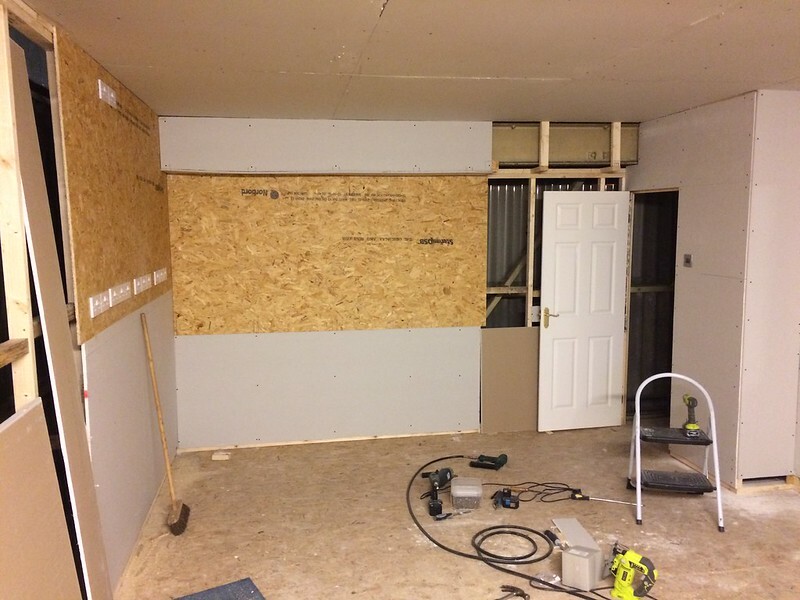 Starting to look a bit more like a room now Another couple of plasterboards will see the interior walls done, then there's just the outside front wall to cover. That will have to wait until Spring/Summer for various reasons. Today I will finish the internal walls & start on the electrics, then everything grinds to a halt for months on end as I'll be spending most of my time in China for the next few months. as I'll be spending most of my time in China for a few months" - bloody long way to go for a take away ? Don't they deliver down your way? Looks really nice and very comfy. Where does the biccy barrel live though?